How can I copy or move contacts from one campaign to another? From the dashboard menu choose Contacts and then Search contacts. There choose the search criteria for the list you want to display. Click here to learn more how to use the search tool. After displaying contacts locate Actions list on the left side of the screen, click it to expand the menu and choose “move to campaign” or “copy to campaign”. In the pop up window choose the destination list name. *move to campaign – removes contacts from the source campaign and adds them to the destination one. *copy to campaign – adds contacts to the destination campaign and leaves them in the source one. Note: Copying contacts duplicates subscribers in your account, this may affect your bill and decrease the import limit. 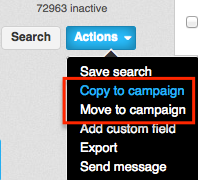 You can also copy or move selected contacts only to another campaign. To do that display your list, check the box beside the email address(es), scroll down the page and click the Actions list to use the copy/move command.